If you are looking to provide increased security by giving flexible control over who and when persons can enter a building or premises, then Mercury Systems will be able to provide the right access control systems for you. We will supply, install and maintain the access control system which will keep your home, buildings, employees and assets secure. Whatever your property size, we have a solution to suit your needs. These may be stand alone systems or fully integrated with your other security solutions such as intruder alarms or CCTV systems. Our Access control systems are aimed towards engineering excellence; this means designing, installing and maintaining intelligent and innovative systems and products that are fit for purpose. We can assist with a huge array of access control equipment. We are vendor-neutral which means you can be assured that you will receive exactly the right technology for you. You will need the highest levels of flexibility and functionality to meet your every requirement. IP (Internet Protocol) Access Control continues to grow in popularity due to its ability to reside on an existing or new IT infrastructure, thereby providing greater flexibility and operability than ever before to provide an effective solution for a single or multiple sites. Your choice of solutions from Mercury Systems, are fully scalable and cater from single-door installations right through to an integrated security solution for sites with hundreds of doors in a wide variety of environments. 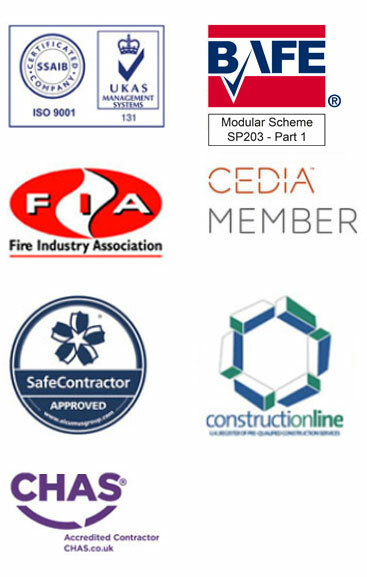 Our expert industry knowledge will ensure your systems conform to the ever-changing regulations and standards. We can work from architect’s drawings for new-builds, or by conducting a full personal survey of your premises, so that we can ensure that your security system meets your specific needs, all relevant legislative requirements, and your budget. Following your installation we offer our outstanding customer service to ensure that all of your preventative security maintenance needs are met.